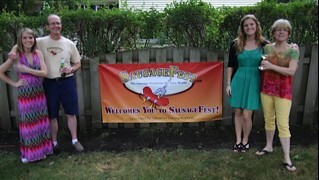 It was a very cool and windy Sausagefest 13 but there was no bad luck blowing into the festivities this year. We had some outstanding sausages this year – both home made and store bought. Maybe it was the year 13 thing or a full moon but the voting for all the categories was either very close or tied. Maybe the lesson was that there were no losers here. For as many judges as we had the voting was in apparent patterns, with many close races. In a year of many divided ballots and close voting the clear winner in any one category was Jack McClure’s Sausage Torte. What is there about a puffy piecrust beautifully golden filled with sausage cheese and some veggies that was hard to like? Apparently nothing. There were other sausages and dishes that deserve mention just because they were so notable. Salmon Sausage with Shrimp and Scallops from The Daily Grind in Lake Bluff, Ill. Thanks to Jeff and Lisa Spector. Hard to believe the combination of fresh seafood can be combined into a sausage and all the flavors work together. On evening of cool fall weather and big red wines, this sausage was made for a great French white burgundy on a warmer evening. The Mild Garlic Boudin Blanc per Chuck Rizzo. A classic white sausage understated and flavorful. Maybe New Orleans does this well but Chuck’s was right there too. 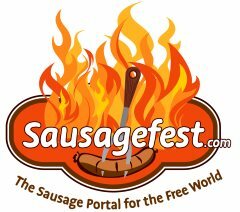 The team of Alan Rohrbach and Rich Klott seem to have a yearlong quest to find small sausage makers and bring them Sausagefest. There was high praise from the judges for Polski’s Jalapeño Brats. They were so good some of the judges voted them as Best Home Made Sausage. Lalich Deli’s Ćevapčići – they disappeared so fast I think the judges never got to taste them. They are annually a star sausage taken for granted. So many good bottles Sausagefest 13 looked like there was no recession hitting this party. The red wines of note were a Sequoia Grove from ’92 (Mr. Rizzo – awesome stuff); Turley Zinfandel (Rich Klott – a great wine from America’s leading female wine maker); a Gingondas and some terrific Malbecs from Argentina. A conservative wine bottle count of 32 bottles consumed; plus about 40 beers. We had The Grapes of Wrath theme for this year’s event reflecting the sober economic times and so many of our friends being out of work. But, the grapes we poured this year were outstanding. Thank god that even the wine industry has adjusted their pricing. Many Thanks Department For grillwork beyond the call of duty, many Thanks to Edward Spengler, Alan Rohrbach, and Steve Chastain. For the Wine Bar duty – Dr. Tommy G. – the fast screw pull east of Napa Valley or at least west of East Lansing. It’s very worth noting that the cigars being passed around were also first class. But what would expect when we have first class attendees. Not that I was noticing but we had Ghurkas, Macanudos, some Monte Cristos (thanks Fidel), Gloria and El Rey del Mundo (be still my heart). Generally, we say cigar smoke keeps the bugs away but that pretext as gone with the cool weather. But, we smoked anyway. Cigars, wine, beer and sausage – it’s a perfect superfecta. For operational assistance during the event, Thanks to Mike Vargas and Jocelyn Kuksa. Finally, many Thanks for infinite patience and support for Kathy, the straw that stirs the drink.